I created a white border along the west boundary of our rear garden, gradually hiding a concrete fence that I find particular offensive. Now this has become slightly wider and of a more definite shape as a result of installing a new, circular lawn this spring. 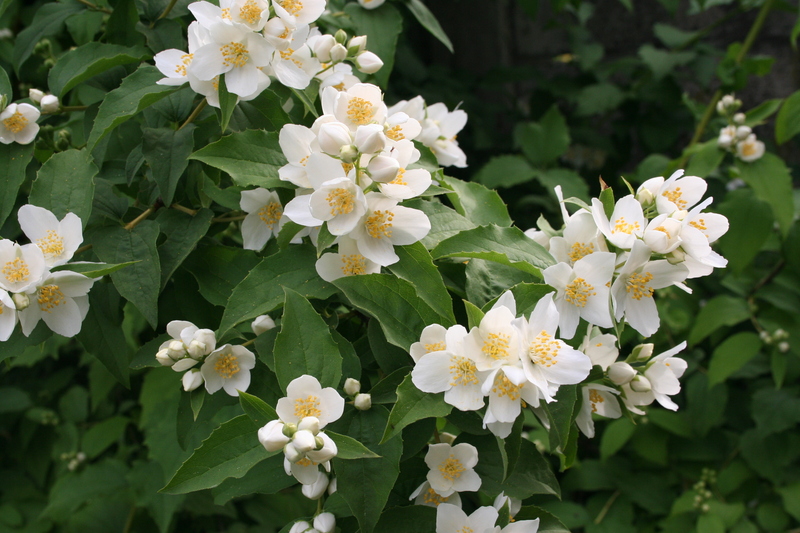 It is an increasingly important part of the garden, leading the eye on towards the oriental garden, which now contains more than a few white plants of its own. Which is why I am so frustrated that despite all my best efforts, plants with flower colours far removed from white continue to show up. Mostly this is because of mislabelling; deliberate or accidental, I know not. White Campanula emerges as conventional blue. The white Peony turned out to be pink, perfectly matching the pink Hibiscus which was also supposed to be white. Recently we have seen white Antirrhinums with a yellow plant amongst them and a lilac coloured Phlox which will need to be moved to another part of the garden this autumn. A neighbour’s bright yellow Kerria has decided to pop up in our border this spring, a shocking contrast to the other spring flowering shrubs. It’s taken me three seasons to sort out the colours of the Lilies I planted in a weak moment and as I battle year after year to create this single-colour border I am beginning to wonder if it is all worth the effort. After all, that lilac pink Poppy looks nice enough and what’s wrong with Nigella plants which pop up just as easily and unexpectedly, even if the flowers are blue? 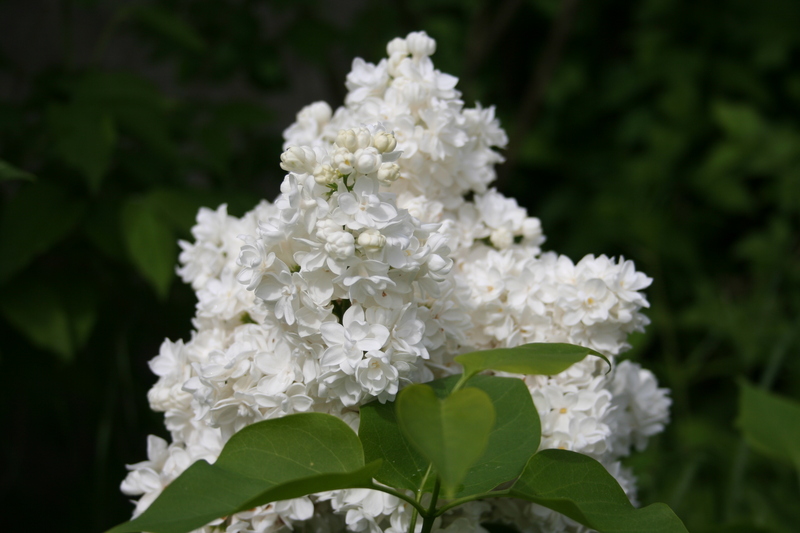 Every so often however, a handful of plants come out together in a range of white and cream shades, gorgeous in the evening light – delicate, sparkling blooms, so often deliciously scented, and my faith returns. After all the fun of selecting new and favourite varieties from the seed catalogues the real work is just starting in greenhouses, airing cupboards and on windowsills: its seed sowing time! Our own efforts began modestly around a month ago and the results, a few trays and pots of seedlings, are now out of the propagator and on the dining room windowsill. First out was Antirrhinum Axiom Mixed, a Thomson and Morgan variety which did particularly well in the bed by the swimming pool last year. The original plants are still out there and we are hoping that if they are trimmed back they will bloom again this year. If not, we have backups in the young plants I have grown from seed. 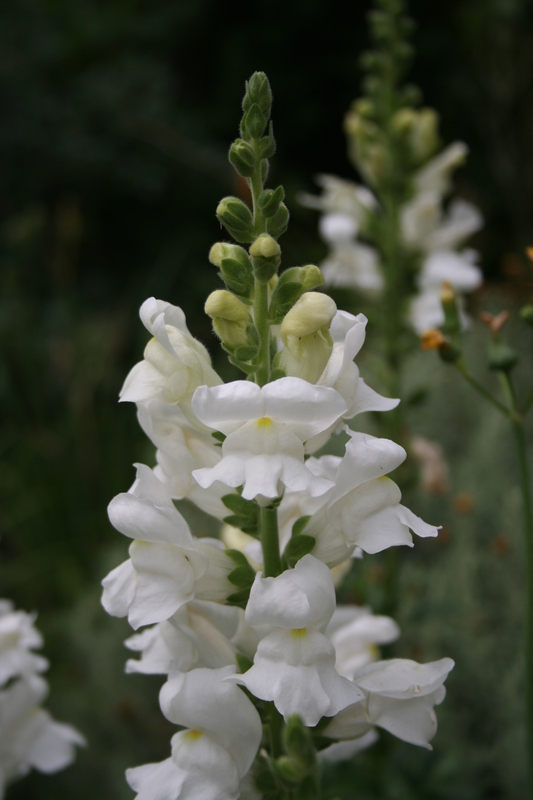 We were so pleased with the Antirrhinums last year that we have also grown some white ones for next season. Our tray of Royal Bride will need potting on very soon and that’s when the problems begin: I just do not have enough growing space once the seedlings are pricked out. I sowed Gazanias two days ago and they are already starting to germinate. I had forgotten they prefer to be germinated in the dark so it is worth reading the label! They were sown, like all the seeds, on the surface of good seed compost bought at the local garden centre. In this case the advice from T&M was to cover with the smallest amount possible of vermiculite and water in. The tray, containing bands of the four varieties I had bought, was then placed in an old plastic compost sack and this put in the heated propagator. The results have been very gratifying and they are now out of the sack and under supplementary lights which we put on whenever the sunshine is weak. 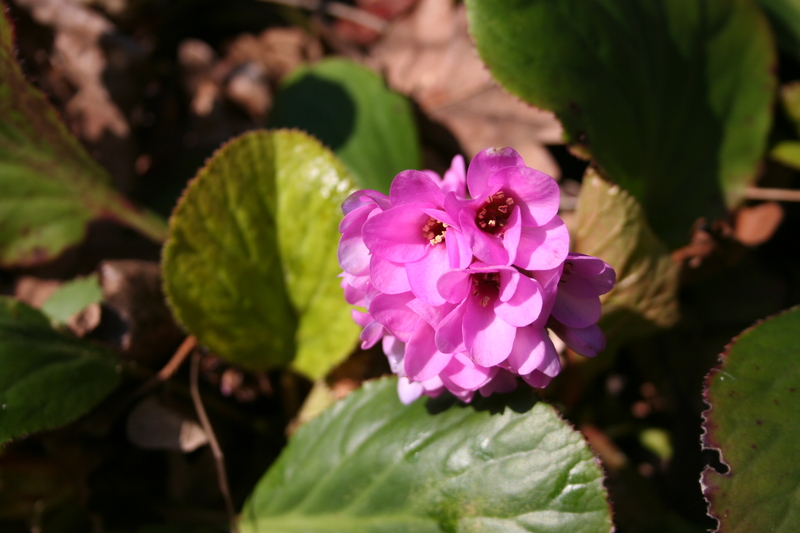 Bergenia in flower today in a neighbour’s garden. Not that the sun is lacking today. It is a bright, clear but chilly day, encouraging Crocus, Hellebores and Bergenia into flower and birds into song. Garden work is beginning to queue up as the days get longer, with recent rains slowing me down outside and office work keeping me busy inside. Today I realised that none of our seven web sites was working, thanks to an ‘upgrade’ of our server on 1and1. In that almost all our business comes to us from these sites, this has caused a bit of a panic. I had innocently assumed that all the clever bits would be dealt with by the technicians at 1and1 or that their software systems would handle everything automatically. Having a cynical side to my character, well hidden, I like to think, I took the precaution of backing up all the sites on my PC, just before pushing the button asking for the upgrade. These saved files, many thousands of them, are slowly uploading in an effort to rebuild our web sites; cross fingers!